As Cinco de Mayo approaches it’s time for pinatas and parties. 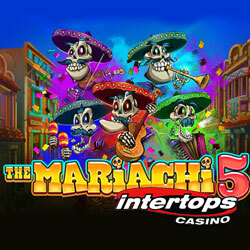 This week, Intertops Casino unveils a festive new Mexican-themed game from Realtime Gaming called The Mariachi 5. Until April 30th, Intertops is giving players up to $500 and 50 free spins to try the new game. The Mariachi 5 is a colorful 5-reel slot game with five mariachi players, lively music and lots of prizes. When three pinatas appear, players pick one of the five Mariachi musicians to reveal bonus prizes: up to 15 free spins with up to 8X win multipliers.